Gas anyone seen Blade Runner 2049 yet? What did you think? After 2 viewings, I think it's a worthy successor to the original movie. It's a nice change from the usual action and superhero movies that dominated the English language movies at the theatre (not that they don't b sometimes have good quality). In addition to looking fantastic, it raised issues well and did not follow cliches. Despite the long run time, it seemed like a short movie for me because I was so engrossed both times. I look forward to seeing it again many more times when it is released in digital format, just as I did with the original and Arrival. I was happy to see packed theatres for both screenings as well. I found it thoroughly enjoyable. I think it's probably too slow paced for some, but really the drawn out plot helped me soak in the atmosphere. And that's what Blade Runner is all about: epic cyber-noir world building. Great visuals and sound design, solid and well cast actors, and just enough story to carry it all. I did feel the length towards the end, but the ending was really satisfying. A movie completely different from the current standards - an unhurried, melancholic and intelligent experience. It expands the universe from the first Blade Runner to include new threads, locations and problems. The filmmakers really sat put a lot of effort to this movie. So beautiful. I wish wish wish I could see it on an Imax screen. There was only me and one other person in the theater and tgat guy left half way through. He mustn't have liked it. I'm glad I saw it, especially in the theater. I would love to explore the world more, and see more story lines from 2049. But it was too long, especially considering the plot. Some koreans walked out halfway through, I think they were expecting an action movie. And while I enjoyed the movie, I do think it was an unnecessary sequel for harrison ford's character. The one eyed woman's section made me think the movie was going into a more purposeful direction (trying no spoilers but people who saw understand what I'm saying). Anyhoo I could go on...it's different than the norm regurgitated movies, def worth seeing in the theater. I saw it on IMAX, liked it and actually didn't notice the long running time, though I thought I would. The scenes/visuals were amazing, though it left loads of irritating (for me) questions unanswered. E.g. (spoiler alert) why did the boss man kill the naked replicant with a knife, how were Harrison Ford and Ryan Gosling able to survive in the Nuclear fallout Las Vegas (I assume because they were both replicants?) How was a replicant able to give birth - was that ever really explained? What was all that crap outside the boundary of LA and how did it get like that etc... I don't know I guess I just like more explanation in my SCi Fi. I thought it was a little long. Ana de Armas is super cute. Great film studies movie. I feel the same about these questions. Especially the bit about Las Vegas because it seemed to definitively answer a question in a way that contradicts recent interviews on the subject. I do think that by leaving this type of stuff unresolved/unexplained they kept the narrative focus on K's story, resulting in a tighter, more effective plot. I didn't care how flawed or slow it was. That ending was one of the most beautifully intense things I've ever seen in a film. I prefer the two new Trek shows over this crap. I think those drones could scan the body and see there was no viable womb, which is what he's trying to make. So he killed the replicant. Looked like that stuff was just a giant land-fill. Most land is unusable so they just drop garbage there. Vegas isn't radioactive any more, the drone that K uses shows the radiation as nominal. So people could live there but everybody thinks its irradiated. As for Rachel it's implied that Tyrell made her like that. She is special in the first one, this film adds the idea that she is even more special that first assumed. That's pretty impressive if you gleaned all that from watching the film. I don't get why making replicants that give birth would be useful though. If you can just make them, why go to the bother of going through the time consuming period of gestation and childhood? Also why kill the replicant even if she hasn't got a womb? She could do other jobs. I don't get why making replicants that give birth would be useful though. If you can just make them, why go to the bother of going through the time consuming period of gestation and childhood. The replicants would reproduce exponentially and eventually outpace factory production. Jared Leto alludes to this when ego tripping on colonizing the universe. Or they could build more factories on new worlds, and then factories would never be outpaced. It's a dumb premise through and through. Can't wait to get the Blu-Ray to see the special features. Did you know that the hologram for Joi was a practical effect? They projected her onto a cloud of fog. Pretty unreal. "Wow, pretty good replacement actress for Rachel!" Uhhhhhhhhhh, that was all CG. I watched it on Saturday and was gripped by it. Not sure what people are saying about it being slow-paced. Things happened often enough to move the story along nicely. Good story, although I think it's tone changed when Harrison turned up, but not as bad as his Star Wars reintroduction/death. I know he didn't want to do the Star Wars thing. I think the music was lacking considering Vangelis's amazing soundtrack for the first. All in all best film I've seen in a while. I only watched it for the first time last month. I thought it was a wonderful cinematic experience. I felt that it was a little slow in the beginning but the [Oscar winning] cinematography, soundtrack and direction helped keep the plot moving. The is he/isn't he guessing of Ryan Gosling's character was a nice element. Harrison Ford didn't add much to this movie IMHO. Now, a cameo by Rutger Hauer would have been great. 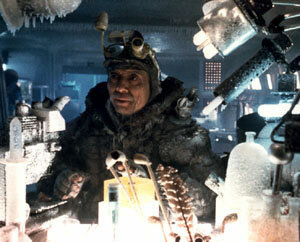 They should have had James Hong's Hannibal Chew character's son in the sequel. Would have fulfilled the inclusion rider that Frances McDormand was talking about, too.